Hello Everyone. 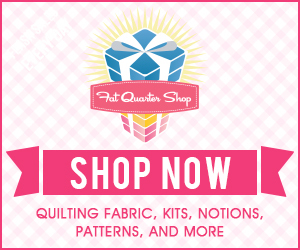 It’s September so that means it’s time to start buying quilting fabric for all your winter quilting projects. I love quilting but I don’t have a quilting machine which limits the number of quilting projects I do. So, since I a bit limited, I tend to stick with small size quilts that can be quilted on my personal everyday machine. This beautiful Jolly Bar Paper Hearts Quilt was made using the Jolly Bar Book Vol.1 from The Fat Quarter Shop. This book contains 20 patterns that can all be created using the Jolly Bar precuts. The jolly bar set contain 42 5″ x 10″ rectangles. With just one jolly bar set, you can create a small-sized quilt that can be done in just one evening. I chose the paper hearts quilt as my project. I am in love! The fabric I chose for this is the gorgeous Prairie from Corey Yoder for Moda. The quilt measures about 36″ x 45″. It is big enough to use as picnic blanket or as wall art. I think I may use mine to hang in my hallway. The colors match my cottage style décor. As you can see the quilting done here is from my machine. I just did straight lines. It is easy to do on my regular machine. For this size quilt, it’s not that cumbersome on a regular machine. So there you have it! You guys definitely need to check out the Jolly Bar Book Vol.1 from The Fat Quarter Shop and all the jolly bar precuts.